The IntelR Media Server Studio (MSS) is a cross-platform (Windows and Linux) application programming interface (API) for developing professional media applications, including video editing and processing, media conversion, streaming, playback,and video conferencing. The IntelR Media Server Studio (MSS) is designed to provide the fastest possible performance on IntelR CPUs equipped with IntelR Quick Sync Video hardware. IntelR Media Server Studio (MSS) effectively uses the GPU to offload transcoding tasks from the CPU, significantly accelerating video processing speed and reducing CPU resource loading. Intel Media SDK supports current Intel processors as well as those that will be available in the future. Applications will not need to be redesigned to take advantage of new processor features as they emerge. The IntelR Media Server Studio (MSS) has extensive video processing capabilities, but it does not provide a comprehensive end-to-end solution for media processing tasks. ADLINK MediaManager fills this gap and provides the following functionality: container file operations (mux and demux), Real-Time Transport Protocol (RTP) receiving/streaming, video composition, and processing of audio elements. Customers developing fully functional media applications will no longer need to write software from scratch to perform these operations. ADLINK Intellignet Video Management Server, MCS-2080 is a powerful x86 architecture system platform, especially designed to support medium to large scale intelligent video management applications. 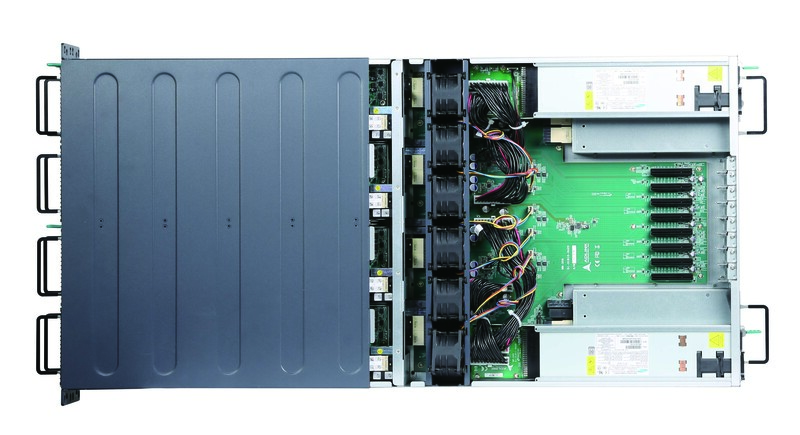 A high density 2U compact chassis design and support for up to 16 IntelR XeonR processors within a single rack mount unit greatly save on server rack cabinet space requirements. In order to provide maximum scaling capability for system builders, the MCS-2080 is designed with PCIe slots available for connecting to 10Gbps network cards or fiber optic Host Bus Adapter (HBA) interface SAN storage devices, which are ideal for high speed, reliable, centralized applications such as video management and backup or archiving of recordings. A High Availability (HA) Network design architecture with two GbE ports per compute node module minimizes the risk of network disconnection during video transmission. Combining the clustering feature provided by the operating system or Video Management System (VMS) software, two system modules can also benefit from an HA architecture to achieve concurrent system backup, safeguarding overall system viability.